This post is sponsored by Perdue. 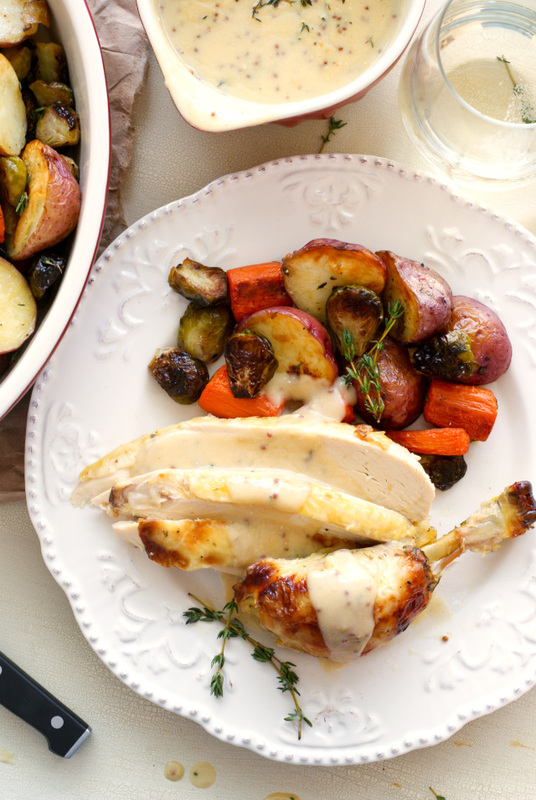 This Oven Roasted Chicken and Vegetables with Mustard-Thyme Gravy is an easy to prepare, homestyle, classic comfort food meal! Earlier this year, our family moved into a new home. We lived without a few major appliances for a few weeks as we waited for them to come in. They were special orders...go figure! Ah, the joys of being a new homeowner. One of the appliances that we lived without for those loooong weeks was an oven. Let me tell you, I did not realize how often I used my oven until I didn't have one! I became the queen of the skillet meal thanks to the cooktop that is built into the island in the kitchen. I made lots of stir fry and taco salads, but boy was I missing my oven baked favorties. I was so thankful when my mother-in-law called me one day to offer to bring us dinner one night! How lovely, right? I was super thankful considering not only was there no oven in our new home, there was also an empty hole where the dishwasher should be. Not having to cook one night meant less hand washing dishes for me. I took her up on her offer right away! Do you know what she made for us? A beautiful roasted chicken and vegetables. Not one meal that I had prepared during the time at our new house made me feel more "at home" than that roasted chicken and vegetables. There is something so familiar, so comforting and so homey about simple classics! I couldn't have asked for a better meal. I decided then and there that if there was ever a time that I was preparing a meal for a friend, whether it be a new mom, or someone who is ill, or someone who has no oven and is desperate for some home cooking, I was going to make them roasted chicken and vegetables. 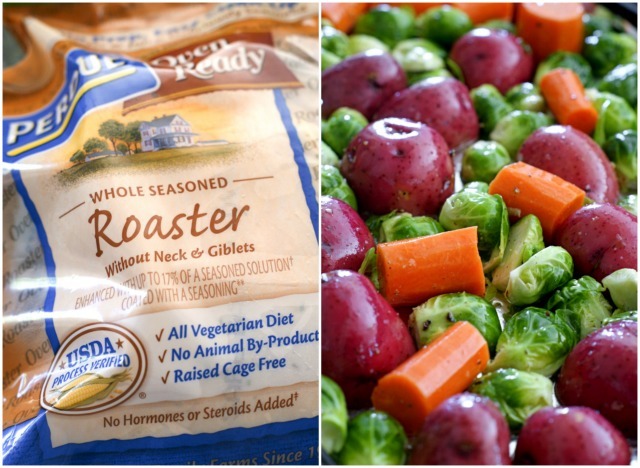 Perdue's Oven Ready Roasters make it super easy make two roasters at the same time, one for your family and one for giving. They come preseasoned all ready for the oven in their cooking bags. Easy, easy, easy. Then, you simply adjust the amount of vegetables you need depending on how many people you are serving, and double the gravy. Making a roasted chicken for giving is also a great choice because you can usually get enough meat for two meals from one roaster, so it's kind of like you're kind of giving two dinners with one chicken! 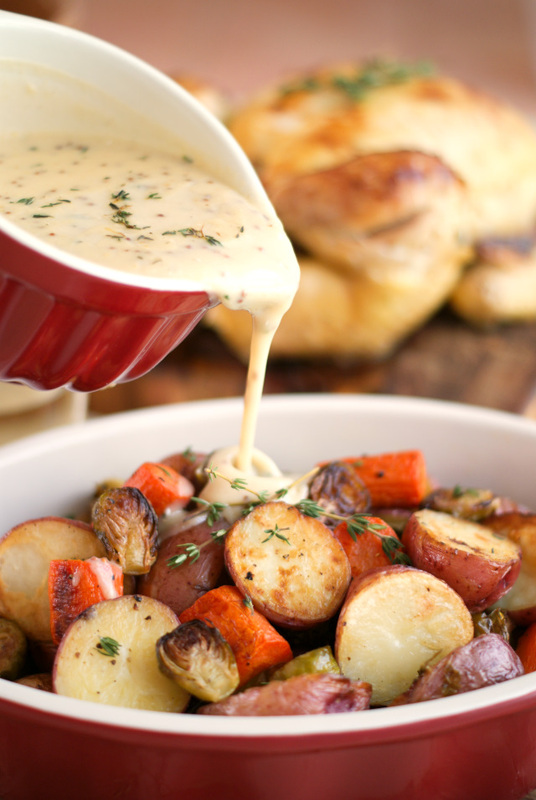 The gorgeous golden roasted vegetables accompanied by the simply seasoned mustard gravy make this a true feel good meal. In the spirit of giving, I'm excited to be working with Perdue in the fight against hunger and to help feed families in need. Visit http://www.perdue.com/promotions/ to learn more about how to Get Deals and #DonateMeals! You can make a comforting meal for someone you love, and by using a Perdue coupon, Perdue will help families in need. So great! I hope you'll check out more from my friends at Perdue! I love that they are working towards helping families in need. You can learn more about Perdue here, join the Perdue Crew to get some pretty sweet rewards here, and follow Perdue on Facebook for recipe ideas, product information, news and exclusive savings here! And don't forget, you can always follow Perdue on Pinterest for lots of chicken recipe inspiration! Now, go print your coupon and get yourself an Oven Ready Roaster to make this delicious meal for your family. And don't forget to pick up an extra one to give to someone you love. You'll be glad you did!. Place the Perdue Oven Ready Chicken into a shallow metal baking pan breast side up. Cut a 1-inch slit into the top of the cooking bag. Place the pan onto a lower rack in the oven and roast for 90 minutes or until the temperature is 180 degrees in the breast. 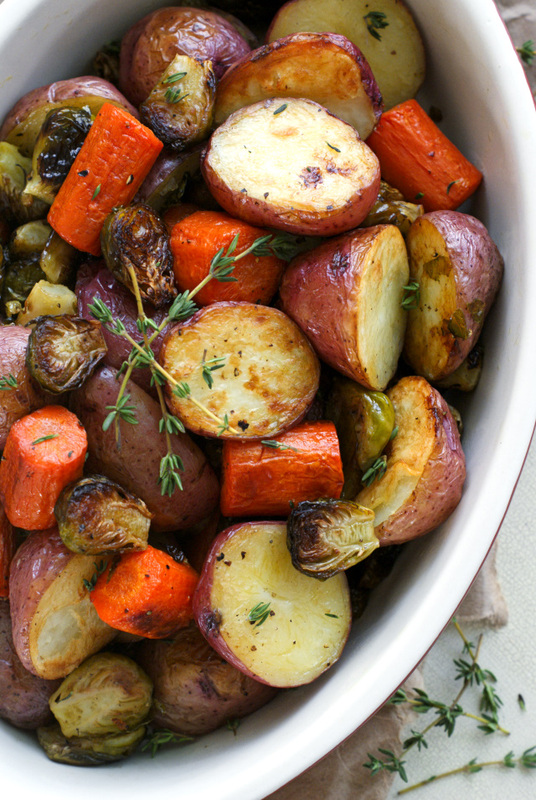 Meanwhile, in a large bowl, toss the brussels sprouts, potatoes, and carrots with the olive oil, salt, and pepper. Spread in a single layer onto a foil-lined baking sheet. When the chicken has 30 minutes cooking time left, add the pan of vegetables to the oven. Remove the chicken from the oven at the end of the 90 minutes and continue roasting the vegetables for 10 more minutes. Let the chicken rest on the counter in the bag until the 10 minutes is up. Remove the vegetables from the oven and place into a serving dish. Cut open the chicken's roasting bag and place the chicken onto a serving dish or cutting board, reserving the juices from the bag. Pour the reserved pan juices into large heatproof measuring cup or bowl. Let stand until it separates and then skim off the fat. Place 3 tablespoons of the drippings into a medium saucepan. Add the chicken stock to the drippings left in the measuring cup (you should have around 2 cups of drippings) until it equals 3 cups of liquid. Add 1/4 cup of flour to the saucepan and cook, stirring over medium heat for 1 minute. Slowly whisk in the reserved juices, mustard, and thyme. Cook, stirring often, for 2 to 3 minutes, or until the gravy is smooth and thickened. Remove from heat and whisk in the greek yogurt. 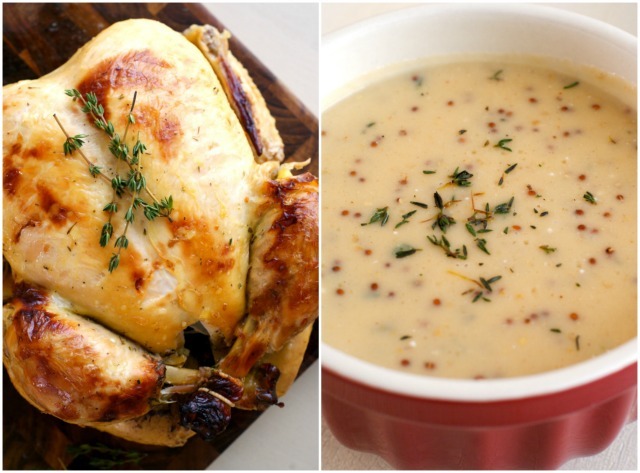 Serve the roasted chicken and vegetables with the gravy. Roast 2 chickens at the same time and drop one off to a family with a new baby, or a friend who isn't feeling well! It's a feel good meal! *Feeding America guidelines: 4 ounces of protein = 1 meal. 1 meal = $0.10. * Maximum donation: 450,000 pounds of protein. This post is sponsored by Perdue. All thoughts and opinions are, as always, 100% my own. This has be drooling, I just love the whole meal!! It was sooo delish! Thanks for dropping by! I'm going to have to look for that roaster! How easy is that? And those veggies...omg. Perfection! It really was a breeze and super tasty! My family would love this dish- yum! It's a classic! Thanks for dropping by. I love Perdue Chicken it's the best and this recipe looks amazing pinning!